To collectors and hobbyists that enjoy the science and study of numismatics, rare mint coins and collectibles are highly valued. Many people mistakenly believe that numismatics is limited to coin collecting. In fact, numismatics encompasses a much broader segment of collecting, research and sub fields. It covers everything that was ever used as currency, the histories that surround the various forms of currency and the scientific study and research of it all. Also included are the collecting and study of tokens, medals and medallions. The word numismatists refers to coin dealers, coin collectors, scholars and historians that are involved in numismatics. In 1933, the United States Mint issued $20 gold double eagle coins. These coins had the words In God We Trust stamped around the edge. 1933 was the last year the $20 double eagle coin was minted. That year a total of 445,500 were minted but they were never circulated. Instead they were melted down because the domestic gold standard was discontinued. The theft of thirty of these rare coins before they were melted left a few of these coins in existence. On July 30, 2002, one of these sold at Sotheby's auction house for $7,590,000. Mint errors, also known as striking errors, are of great interest to numismatists. In 2007 the George Washington dollar was minted. It was the first coin stamped with the words In God We Trust inscribed around the outside edge since the 1933 $20 double eagle. The United States Mint struck an unknown number of these $1 coins without the words. When the error was first discovered, the first ones sold for approximately $600. 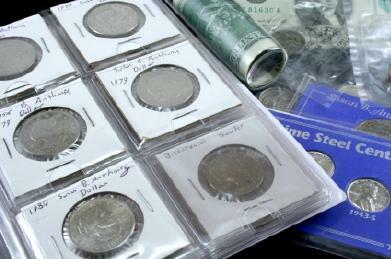 As more error coins surfaced the value dropped to approximately $50. This is a good example of the value of coins depending on the number of coins available, or supply and demand. The double die 1969-S Lincoln cent is an example of a very valuable rare mint error. It was found in an uncirculated roll of pennies and sold for $126,500 at auction. It was graded in mint state and there are only believed to be only twenty-five of these pennies in existence. One of the rarest coins in the world is the 1804 U.S. silver dollar, with only fifteen known surviving specimens. Oddly, there were not any silver dollars struck in 1804. They were struck in 1830 and 1858 as commemorative gifts. A Class III 1804 U.S. silver dollar recently sold at auction for $2,475,000. The term Class III means the coin was struck in 1858. There are six known specimens of the Class III coins with three of those in museum collections. A selection of United States Mint pre-1933 rare gold coins including a $20 Saint-Gaudens gold coin, a $10 Indian head gold coin and a $2 ½ Indian head gold coin. A complete numismatic alphabetical directory. One of the most complete resources for numismatic links is found on Your Hobby. The Numismatic News blog covers a lot of information on coin collecting. In the world of numismatics, rare mint coins hold a place of honor. Each one is a piece of history that has been preserved and guarded throughout the years.